Coffee shop owners have unique needs among business owners. Their employees are usually flooded with orders during the morning rush, and customers who have not had their coffee yet can be difficult if their order turns out to be incorrect or if it takes a while to get it. Coffee shops also get unique and complicated orders like a double cupped, no whip, 2 pumps caramel, 1 pump white mocha, 2 scoops vanilla bean powder, extra ice Frappuccino. The following point-of-sale systems will help you get these orders correct and run your coffee shop’s daily operations, such as managing labor, inventory, customer loyalty programs, and other necessary tasks to run your business. However, you should know that this is not a comprehensive list of coffee shop point of sale software programs, so you can always look for other programs that might better suit your business’s needs. Coffee Shop Manager. Coffee Shop Manager is a point-of-sale software for specialty coffee shops. You can track hours, communicate with employees, sell retail items using a barcode scanner, and perform other tasks that will help your café run smoothly. Coffee Shop Manager also has a no-fee prepaid customer account feature, which lets you set up loyalty and gift card programs so that you can keep customers coming back to your coffee shop. You can find a review of the features of Coffee Shop Manager here. Coffee Shop Point of Sale (POS) by BEPOZ. Coffee Shop Point of Sale by Bepoz motto is “Happy Customers = Loyal Customers.” BEPOZ is designed with customer loyalty in mind, which is why this point of sale software has strong customer relationship management features. For example, you can run email marketing campaigns with BEPOZ by emailing customers prize points, coupons and loyalty prizes directly from the program. Cafe Cartel Systems Pointe of Sale Software Systems. Café Cartel Systems Pointe of Sale Software Systems has provided POS installs for coffee shops and cafes around the world for more than 10 years now. Café Cartel Systems is designed to be integrated with QuickBooks, so you can manage your sales with Café Cartel Systems, but do all the accounting in QuickBooks. SP-1 Coffee Shop and Restaurant Point of Sale System. SP-1 Coffee Shop and Restaurant Point of Sale System claims to have pioneered the graphical interface for coffee shop point of sale software. SP-1 is designed to be easy to use; in fact, SP-1 states that employees will require zero training to use their software. While that might be an overstatement, the software is easy to use, and employees should be able to pick it up with ease and minimal training. A good point-of-sale system will help your coffee shop run smoothly. Orders will be correct, inventory levels will be monitored, and you will be able to manage your employees better with labor management and other tools. 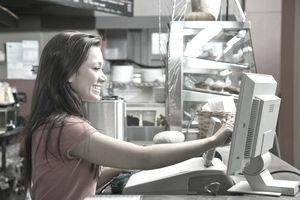 Employee theft or double purchases on reward cards will not be an issue with the proper point-of-sale system. For example, you can use Café Cartel System to assign a cash draw to a specific cashier, which enables you to hold them accountable for any overages or shorts in their cash draw. Time management features, such as clock-in and clock-out functionality in many of these point of sale systems, eliminates errors in timekeeping and ensures that employees are only paid for the hours that they work. You may also want to read the article on what you should look for before buying accounting software, which will give you tips and suggestions for what you should consider before investing in any accounting software for your small business.